Diamonds are pure carbon, like charcoal, only in a crystalline form. Diamond is the hardest naturally occurring mineral found on earth. Diamonds melt at 4,000oC, much higher than most metals, and are resistant to chemical alteration or contamination, though they can catch fire almost as well as coal does. It is best to not examine a diamond ring in an open flame because it can burn. Diamonds have excellent heat conduction capabilities, four times better than copper. Diamond has a density of 3.51 g/mL,and so is more dense than graphite which is also made of carbon. The density of graphite is only 2.26 g/mL. High pressure is required to make diamond from graphite. Coal is formed from particles of graphite along with organic impurities. Diamonds are thought to originate at a depth of 90 miles (150 kilometers) under high pressure. They are found at the surface because volcanic pipes carry them explosively quickly to the surface, and result in a type of mineral called kimberlite that is known to be associated with diamonds. One theory, that the explosive pipes are created by the movement of liquid carbon dioxide, is described in Science News. Large diamond mines are found in South Africa, Brazil, Canada, Russia, and Australia. Interestingly, nanodiamonds called diamondoids  are found in every drop of crude oil. Scientists hope to harness nano scale diamonds to utilize some of diamond's special electron emitting properties. Various researchers tried to synthesize diamonds, the first reported were in the late 1800's when small pieces of graphite suspended in molten iron were pressurized into diamonds as the iron cooled. This was difficult to replicate, and research continued. Tracy Hall, a physical chemist working for GE managed the first commercially successful synthesis of diamond on December 16, 1954 (announced on February 15, 1955). His largest diamond was tiny, but very useful for diamond grit in industrial processes. Synthetic diamonds are still mainly produced by very large presses that can weigh two hundred tons. Chemical vapor deposition, invented in the 1980s, can form a layer of diamond on a surface by producing a plasma over the surface that deposits graphite and diamond, but continually removes the graphite, leaving the diamond. Recently, synthetic, gem quality, diamonds, usually yellow, have been made  that may change the whole structure of diamond marketing. Researchers hope to develop diamond semiconductors that will have special properties and function in strange environments. Gemesis, in Florida , and Apollo Diamond, in Boston, are startups who manufacture diamonds to develop new semiconductors. De Beers Diamond Trading Company has set up a Gem Defensive Programme to supply gem labs with machines that can distinguish man-made from mined stones. Diamonds are interesting to creationists because they are thought to be very old but still have traces of Carbon-14 in them. The RATE project  investigated various radioactive dating techniques, and noted that diamonds which are thought to be hundreds of millions of years old, have a Carbon-14 content more consistent with less than 90,000 years. In items more than 90,000 years old, all available Carbon-14 should have decayed. DeYoung notes that there are three possible explanations for this presence of Carbon 14 that would preserve the diamonds' old age. First is contamination by Carbon-14 in groundwater supplying new atoms. This is very unlikely because different depths and densities of rock should show different levels of contamination, but the measured traces of Carbon-14 are fairly uniform. Secular researchers have also replicated RATE's finds of carbon 14 in diamonds and they used diamond samples that are impervious to most types of contamination. Six fragments cut from a single diamond exhibited essentially identical 14C values – 69.3 ± 0.5 ka–70.6 ± 0.5 ka BP. 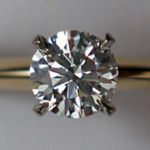 The oldest 14C age equivalents were measured on natural diamonds which exhibited the highest current yields. A second suggestion is that nuclear decay in surrounding rock affects the Carbon-13 or Nitrogen-14 in the diamond to create recent Carbon-14. This could happen, but calculated rates of formation of Carbon-14 would be thousands of times less than the measured amounts. ↑ Zim, Herbert S.; Schaeffer, Paul R. (1957). Rocks and Minerals: A Guide to Familiar Minerals, Gems and Rocks. New York: Golden Press. p. 83. Library of Congress Catalog Card Number 61-8326. ↑ Price, Monica; Walsh, Kevin (2005). Rock and Minerals. London: Dorling Kindersley Limited. p. 18. ISBN 1-4053-0594-0. ↑ Thousands... Not Billions: Challenging an Icon of Evolution, Questioning the Age of the Earth by Don DeYoung. Master Books, 2005, 190pp. ↑ R. E. Taylor and J. Southon, “Use of Natural Diamonds to Monitor 14C AMS Instrument Backgrounds,” Nuclear Instruments and Methods in Physics Research B 259 (2007): 282–287. Thousands... Not Billions: Challenging an Icon of Evolution, Questioning the Age of the Earth by Don DeYoung. Master Books, 2005, 190pp. Carbon-14 in Fossils and Diamonds, An Evolution Dilemma by Dr. Andrew A. Snelling, Answers in Genesis, December 8, 2010, Accessed 21 May 2015. This page was last modified on 21 May 2015, at 15:28.